His Divine Grace A.C. Bhaktivedanta Swami Prabhupada is the Founder Acharya of ISKCON. At an advanced age of sixty-nine, with just forty rupees, Srila Prabhupada boarded a steamship nound from Calcutta to New York City in 1965 to preach in the western world. He later founded ISKCON in the year 1966. From 1966 to 1977, in the last eleven years of his life, Srila Prabhupada circled the globe twelve times that took him to six continents. In spit of such a vigorous schedule, Srila Prabhupada translated and commented on over eighty volumes of the Vedas' most important sacred bhakti texts, including the Bhagavad-gita. 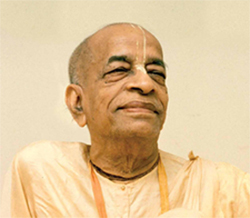 He also opened 108 temples all over the world and inspired thousands of Westerners and Indians to devote their lives to Krishna consciousness, launching one of the fastest-growing spiritual movements in the history of the world. Hundreds of temples on six continents, totaling at - least 650. The world's largest publisher of books (51.6 crores book already distributed) on the ancient Vaishnava teachings- The Bhaktivedanta Book Trust! The world's largest vegetarian food relief program. The Annamrita Food Relief program feeding over 1.2 million school children daily, in India. Global headquarters in Mayapura, West Bengal India, draws one million pilgrims each year. The Temple of the Vedic Planetarium, when completed can hold over 10,000 people in its main worship hall! Millions of well wishers, thousands of serious practitioners- truly the United Nations of the Spiritual world!